AFRICAN HOPE LEARNING CENTRE | In 2018 we celebrate 20 years of providing a place of learning for African refugees in Cairo, EGYPT! 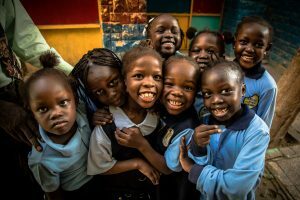 African Hope Learning Centre (AHLC) promises a better today and brighter future to African refugee children living in Egypt. Laughter can be heard, as children play and are given the luxury of an education that many refugees still don’t have access to. AHLC is located in a relatively small building that once housed a family of 8 in the greater Cairo area. Every possible space is utilized, with both morning and afternoon shifts, in order to accommodate the many students who have sought refuge in Egypt due to war, violence and persecution in their home countries. Due to overcrowding and prejudice in local schools, refugee children need alternate learning centres. AHLC is a safe place of learning for more than 450 refugee children, K-8, with at least 10 different African nations, including North and South Sudan, Eritrea and Ethiopia. It is here where students receive instruction in core subjects, character training, access to basic health care and are guaranteed a nutritious, hot meal each day. School fees are kept as low as possible, covering 30% of running costs, in order to welcome the most children while respecting their unique economic situation. AHLC is a not-for-profit charity (U.S. tax receipts available). Your investment can make a huge difference in a child’s life while enabling us to keep our doors open. Please consider partnering with us to educate these children and give them a brighter future. We are glad to have you visiting our site. In 2018 we celebrate 20 years of providing a place of learning for African refugees in Cairo, EGYPT! Address: Corner of roads 107 and 159 (#18) Maadi, Cairo, Egypt.